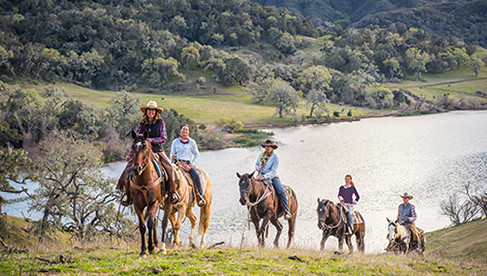 Fourth-generation rancher Danielle Otis of Western Pleasure Guest Ranch, shares the history and meaning behind the term, "dude ranch." Recently, I was asked an interesting question by an individual who had never heard of a dude ranch. The question was, is a “dude ranch” just for men or can anyone come? I have to admit, I laughed a little when I first heard the question. After more thought, I am surprised that given the modern use of the word “dude”, I don’t get this question more often. Dude ranches are for cowgirls too! Photo courtesy Visit Idaho. Western Pleasure Guest Ranch. Photo courtesy Danielle Otis. 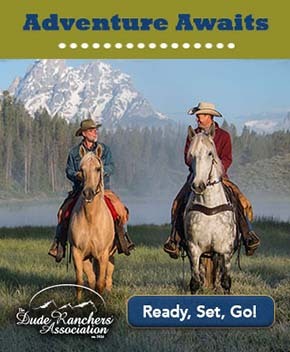 These modern uses of the word are most certainly where most of the confusion arises when someone hears the term “dude ranch,” and is led to--quite naturally-- ask if the ranch is just for dudes…guys…men. To understand the reason we call our ranch vacation destinations “dude ranches," the more classical context of the word needs to be understood. The first known use of the word arose in 1880 and its origin is unknown, although some sources say that it is of German origin. Still, other sources state that the word is of Irish origin and comes from the Gaelic word “duid,” which means “foolish,” or “stupid”. Apparently, the Irish ranch hands on the American west applied this term to the ranch guests who visited from the East Coast. I can hardly be convinced that a whole industry would willingly take on a term to describe themselves which paints their clients as “foolish,” or “stupid”. That doesn’t sound very good for business if you ask me! Guests can get a taste of the authentic American West at Western Pleasure Guest Ranch. Photo courtesy Danielle Otis. Another old use of the word “dude,” comes in the form of a verb. Dictionary.com defines dude as a verb which means to “dress up elaborately.” For example: a sentence I can easily imagine my grandmother using-- “the groom was all duded up in silver and black”. I am more inclined to believe the industry’s use of the word “dude,” originating from this context. Many dude ranches have horsemanship programs for riders of all levels. Photo courtesy Danielle Otis. It's okay to play cowboy on a dude ranch vacation--that's the whole point. Photo courtesy Danielle Otis. The meaning and use of "dude” is as varied, it seems, as the people who use it. Dude ranches are not just for men. No--they are for anyone who wants to experience the spirit of the West. They are for anyone who saw that western movie and wished they could saddle up and ride into the sunset with John Wayne, Roy Rogers, or even Billy Crystal. To avoid confusion--which I hope I have just cleared up somewhat--many ranches have chosen to identify themselves as a “guest ranches." But whether you call it a guest ranch, or a dude ranch, makes no difference. The same goal and the same purpose lay at the foundation of every dude and guest ranch; to keep the principals, adventure, and spirit of the West alive---and to help their guests discover it through an authentic, western ranch experience. About the Author: Danielle Otis was born and raised on her family's fifth-generation ranch in the northern panhandle of Idaho. From a young age, a love for ranch life and a respect for the land were cultivated in her. Today, she and her husband, Landon, are raising their own children on the family ranch and instilling in them that same love for the outdoors. Danielle continues to work on the family ranch, Western Pleasure Guest Ranch. During the summer, she manages the children's horsemanship program. She says, "it is so rewarding to see these children, many of whom have never ridden a horse before coming here, learn these horsemanship skills over the course of just a few days. In the process, they gain some amazing life skills without even knowing it." During the off-season, she works in the ranch office and manages the marketing. Her great passion in life is keeping the western lifestyle and its values alive and sharing it with the guests who visit Western Pleasure Guest Ranch. Learn more about the ranch on their blog. Follow Danielle on Instagram: @iloveiliveiride. Follow Western Pleasure Guest Ranch on Instagram: @westernpleasureguestranch.